I am a frequent DVD ripper user. I have a large collection of DVDs and a number of them are copy protected. I tried to backup them up in the past few years and want to make them unprotected so that can watch them on the local hard drive by MPC-HC or iPad for kids or sometimes burn it back to DVD to play on my DVD player. I want a DVD ripper that is able to handle protections from different DVD manufacturers like Disney, Beachbody, DreamWorks, BBC, Paramount etc to the hard drive, iPhone and iPad. It would be great if the DVD ripper is able to take full advantage of all the 8 cores or use other technologies to speed up the ripping and save time. And, I must say WonderFox DVD Video Converter is the one that truly does the job. Update: WonderFox DVD Video Converter adds the 1:1 copy mode in a recent update, making it the fastest DVD ripper. CSS and region code are widely used to protect DVDs from being pirated. WonderFox DVD Video Converter makes me believe it easily handles those two kinds of DVD encryption as I have great success ripping Disney kids’ DVDs Toy Story 3, Frozen, Monsters University, Kung Fu Panda, Tinker Bell and the Lost Treasure etc with this program to iPhone 7 as well as MKV in HDD. Besides, RCE, Sony ArccOS, UOPs, Disney X-project DRM and other protected DVDs are also supported and any DVD can be ripped to over 200+ video formats including MKV, MP4, WMV, AVI, MOV, AVCHD and portable devices from Apple (Apple TV, iPhone/iPad, and iPod), Google, Samsung, Sony. From its update log, we can see WonderFox updates its this DVD ripping program every one or two months to fix bugs, add new features and continuously support the latest DVD copy protection. Ripping DVDs takes time. Every DVD ripping program authors seem to work hard to speed up the ripping process. WonderFox DVD Video Converter is able to take full advantages of multiple CPU cores and Intel® Core™ and GPU (NVIDIA® CUDATM and AMD®) acceleration. And I do find the ripping faster if I enable Batch Conversion. 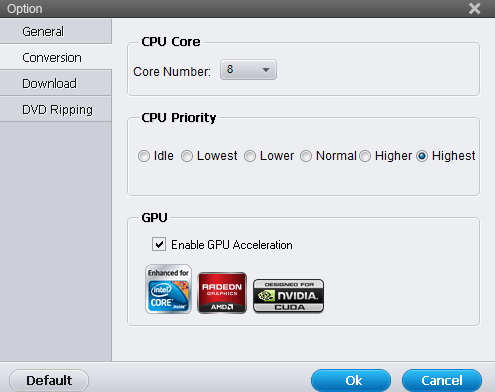 Make sure you go below Option to set the maximum core number and highest CPU priority and enable GPU acceleration to get the super fast ripping. Besides that, the smart-fit encoding technology in video and audio outputs almost 1:1 video and audio quality files and the compression rate is impressive and the output file size estimation is accurate. And, the 1:1 copy mode is believed to be the fastest! Check my review for it. WonderFox DVD Video Converter can do more than what you think. 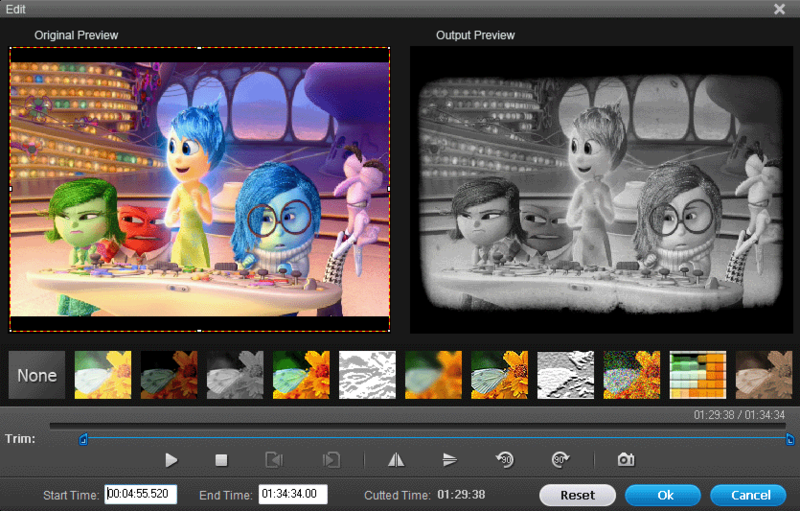 It also works as a functional video converter and offers basic but functional video editing features, making it easy to merge, trim, crop and add special effects to any HD/4k/8k video like HD AVI, HD MP4, HD MOV, M2TS, AVCHD etc. and converts them to iPhone 7/8, iPhone X or Plus, iPad, Apple TV, Samsung, Sony, Chromecast, smart TVs etc. WonderFox DVD Video Converter is also a great YouTube downloader. Downloading Vevo videos from YouTube is easy and fast. Any downloaded YouTube video will automatically be added to the list for converting. But you always free to keep the original video format for playback on computers instead of converting it to iPhone, iPad more friendly formats. You are also able to download Facebook, Vimeo, Liveleak, Metacafe videos and do 10 simultaneously. The program is super easy to use. A simple guide in the main UI shows you how to add/download videos to convert or rip DVDs. It does what you can expect from a DVD ripper, ripping protected DVDs to whatever video formats or devices. The smart-fit encoding technology frees those who are not so computer savvy. You don’t have to change anything else and leave the program to do all you expect. It is an all-in-one YouTube downloader and converter. You can convert your YouTube videos to any video formats. The senior mode is really nice for feature for the senior. MKV only keeps one language or subtitle track. It would be great if two different audio or subtitle tracks can be converted into a single MKV file so that I can switch between them. WonderFox DVD Video Converter works great as the DVD ripper on Windows and I do think it is god-given and talented. I see the company WonderFox Soft working hard on DVD encryption and continuously upgrades the program to keep up with the latest DVD protection and it did work great on me with different region DVDs as well as kids’ Disney movies. Although there are some cons or feature-missing in the program, just give WonderFox a little time, it will satisfy you. ← Aimersoft DVD Ripper Failed to Rip DVD in Full! Want an Alternative? Great post! Very useful content for us. Harry recently posted…Laptop or Tablet Rental- why and how?